An absolute must for any party, these yummy treats will disappear almost as fast as you can make them! Place eggs in small saucepan and add enough cold water to cover eggs by 1 inch. Heat to boiling over medium-high heat; reduce heat to medium-low and cook 10 minutes longer, adjusting heat as necessary to maintain a brisk simmer. With slotted spoon, transfer eggs to bowl filled with ice and cold water. Once cooled, peel eggs while submerged in water. Cut eggs lengthwise in half, and carefully remove yolks to medium bowl, keeping whites intact; reserve whites. Mash yolks with fork; gently fold in mayonnaise, chives and dry mustard. Season with salt and pepper and gently mix until well combined. Transfer yolk mixture to large zip-top plastic bag with bottom corner snipped off (or use a spoon), and evenly divide yolk mixture into reserved whites. 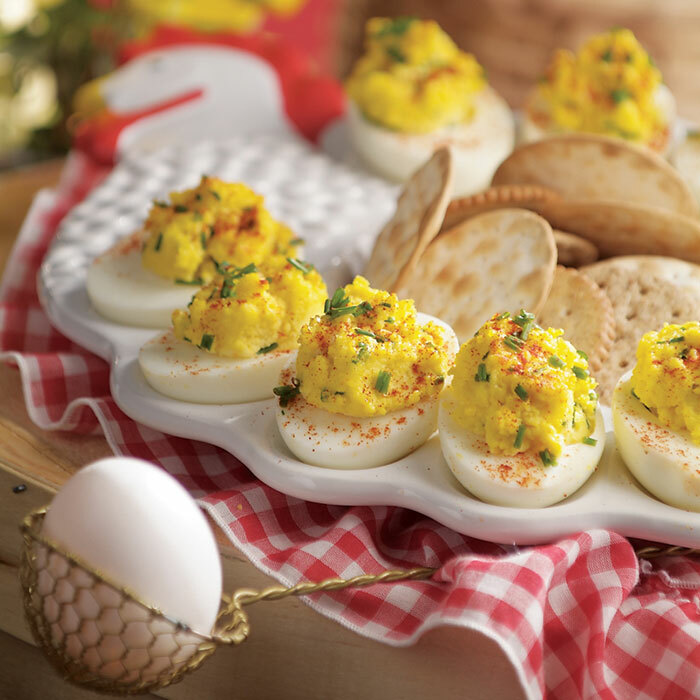 Arrange deviled eggs on serving platter. If not serving right away, cover and refrigerate. Garnish with paprika and chives just before serving.